French President Emmanuel Macron says Notre-Dame cathedral will be rebuilt "even more beautifully" - and that he wants the work done within five years. But despite Mr Macron's pledge experts say its reconstruction could take decades. "We'll rebuild Notre-Dame even more beautifully and I want it to be completed in five years, we can do it," said Mr Macron, who had already pledged to launch an international fundraising scheme for the reconstruction. But Eric Fischer, head of the foundation in charge of restoring the 1,000-year-old Strasbourg cathedral, told AFP the Notre-Dame may take "decades" to rebuild. The blaze - which was discovered at 18:43 (16:43 GMT) on Monday and was fully extinguished almost 15 hours later - destroyed most of the cathedral's roof and led to the collapse of its iconic spire. They sit or stand in a crowd, many of them young people, spilling over the end of the Boulevard Saint Michel, this first evening after the fire, singing hymns. On a table beneath the towering sculpture of Saint Michael stands a statue of Our Lady - Notre Dame. "As a French Catholic," says Éloi, 22, "I felt really bad after the fire so I see this vigil as a way to say that even if the flames destroyed the cathedral, we can rebuild it because the Church is made not of stones but is a living body." He believes the cathedral should be remade just the way it was, as a "prayer to God". 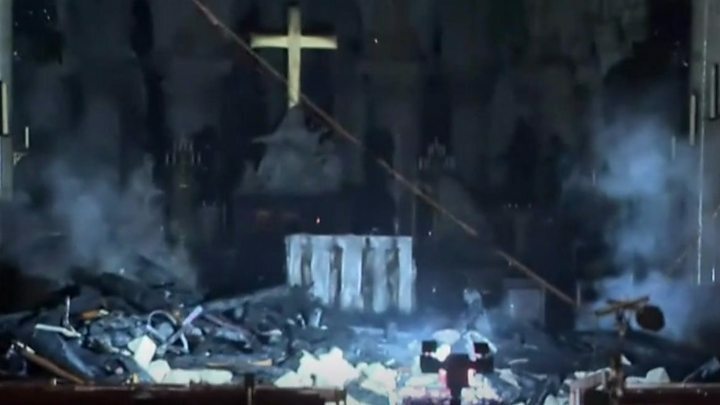 "We are Catholics," he adds, "but all French people - Catholics, Muslims, atheists - are united around this disaster and in the hope it will be rebuilt." 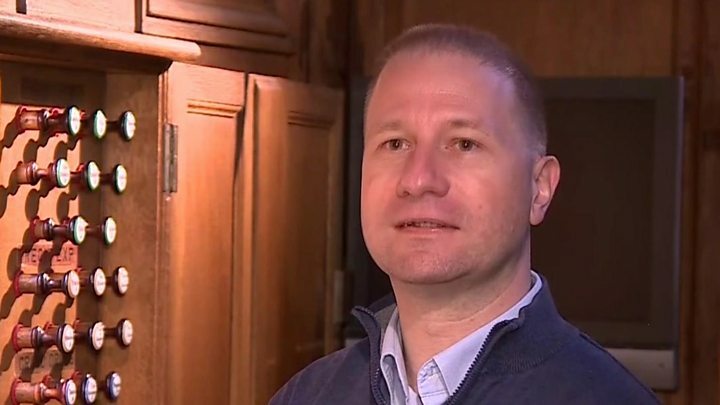 "Nothing indicates this was a deliberate act," said public prosecutor Rémy Heitz, adding that he expected to be a "long and complex" case. The cathedral's paintings would be removed from Friday, Mr Riester said.